If you’re a small business owner, your business is facing a huge danger in the form of shoplifters and burglars. According to Safewise¹, small businesses lose $25,000 to $33,000 every minute thanks to the prevalence of shoplifters. And businesses are burglarized far more often than homes. West Bend² reports that businesses are robbed every 10 seconds, leaving owners at a complete loss. There’s only one way to prevent theft and burglary of your business and its assets: a security system. Here are five reasons every business owner needs a security system. A security system lets you watch, monitor, and record all activities that occur on your property. A business-wide security system includes equipment and features like motion detectors, intrusion alarms, and perimeter monitoring that all help minimize burglaries. When a potential thief sees evidence of a security system, they often change plans and won’t commit a burglary. A sign from your security system placed on a door or window, or visible cameras and lights, will act as a deterrent. Should a theft occur, a security system will help you and the local authorities track down the thieves. Videos can be shared with law enforcement agencies, helping them solve the crime. Today’s security systems are easier than ever to manage too. You can check in on your business’ cameras, lock or unlock doors, and even record activity right from your own computer or smartphone. Many business security systems also come with a monitoring plan that provides regular security reports with time stamps to give you a complete overview of your business operations and security. When a break-in or robbery occurs at your business, it’s extremely important to immediately notify local law enforcement. Time is of the essence when a crime occurs – the more time that passes between a burglary and law enforcement’s arrival, the less likely it is the criminal will be caught. Your security cameras can provide real-time monitoring during an emergency situation. Not only will you be able to alert the authorities quickly, but you’ll also have the ability to share recorded videos with them. Your security system also can notify you when an event occurs. From motion sensors that send you alerts to open door or window notifications, a security system can catch burglaries in seconds so you can notify the police before it’s too late, or even before significant losses occur. One expense that can really cut into your company’s profit margin is insurance. While insurance is a necessary cost of doing business, it’s often far more expensive than it needs to be. If you want to save money, you may be able to get a break on your insurance premiums by installing a security system. Insurance companies are on the hook and have to reimburse or assist you financially if disaster strikes. With a security system in place, you’ll prove your taking steps to prevent the worst from happening. Because your security system will catch or prevent crises like burglaries and fires, you’ll have video evidence of exactly what took place to hand over to your insurance company. A good security system can help prevent such occurrences or limit the amount of damage, both of which can reduce the number of insurance claims filed. Wireless Capability: Today’s smartest commercial security systems aren’t hard-wired to your business’ property; they’re wireless. A hard-wired security system can easily have its electrical wires cut by burglars. Wireless security systems make it more difficult for thieves to find and disable, meaning your business will be better protected. Night Vision Video Surveillance: When you’re off your business’ premises, you can’t monitor what’s happening. To keep your business safe, your security system must include video cameras that can capture footage with night vision. This eliminates the need to keep your lights on in order to capture security videos, and it ensures your business is being monitored all day and all night. Remote Monitoring: A security system that requires you to be on-site in order to monitor what’s happening isn’t a smart idea. Instead, choose a system that offers remote monitoring, which lets business owners live freely without worrying about security. Your security company will handle the monitoring for you and will contact you if something suspicious happens. Additionally, you’ll be able to check in on the video feed from your smartphone or computer when you’re out of the office. While prices vary significantly depending on the features you choose for your security system, a typical professionally installed system costs around $1,500, Business.com³ reports. These pricier systems typically include professional installation, multiple cameras, a monitoring plan or package, and additional features that let you control an advanced whole-business security system. If you want to make your business more secure but do so affordably, you can create a do-it-yourself system by choosing different security components and performing the installation yourself. In comparison, a DIY security setup has an approximate cost of about $300 according to Business.com⁴. Remember, the more elaborate the security system, the higher the cost. 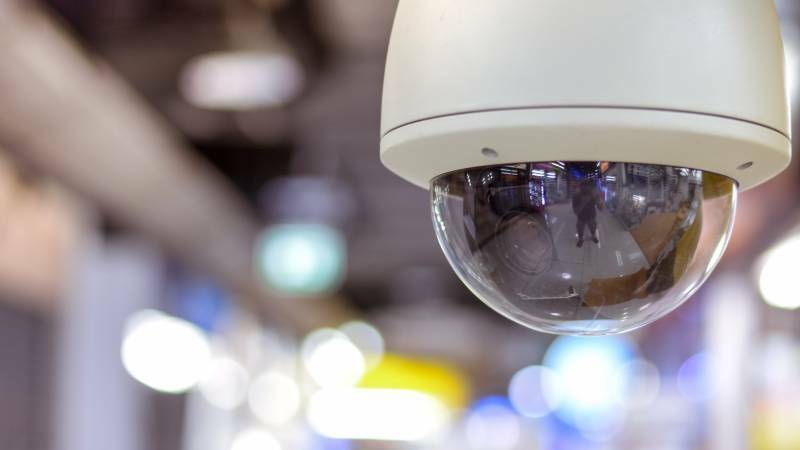 You can, however, create the perfect security system for your business by buying cameras, monitoring software, and even smart locks and other tech-savvy security options in order to stay within your budget. If you’re considering installing a security system at your business, there’s no better time. With burglaries on the rise each and every day, you need to take action in order to protect your business, your employees, and your assets. Waiting any longer could put you at risk of robbery. Fortunately, today’s security systems are both easy to use and affordable. Whether you’d like to add a professionally monitored and installed system or create a secure DIY setup, there’s an option out there that meets your business’ needs. Before you get started and select a security system, make sure you do your research. Look at a variety of different options online – and don’t forget to compare pricing and costs. Many of the top security companies, like ADT and Frontpoint, offer free quotes or estimates. These free quotes can help you find the most affordable security system for your business, and it doesn’t cost anything to get started. If you’re interested in a security system for your business, start a search today. 1 SafeWise, How Small Business Owners Can Protect Themselves Against Theft 2 West Bend, How to Burglar-Proof Your Business 3 Business.com, How Much Should You Spend on Small Business Security Systems? 4 Business.com, How Much Should You Spend on Small Business Security Systems?